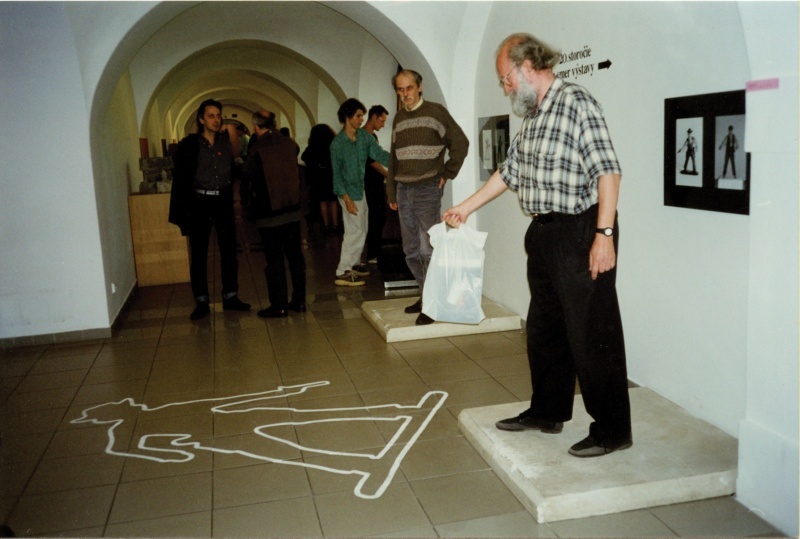 In 2000 I realized the installation of two photo series and the white colour line piece on the floor. The photo series was based on "the dialogue" of a small plastic cast cowboy figure (toy) and real man acting the same pose as the figure. On the floor I made a white colour link of a small plastic cast cowboy figure in a human size. The pieces were installed in the space where two statues were deinstalled and free pedestal were left. On the opening artists (and my tutors from student times) Ľubomír Ďurček and Július Koller stepped on the pedestal and performed "the cowboy poses" for a while.